Posted July 4th, 2014 by Claire Dunning. The invitation to a Business Leaders’ Breakfast Event said the speaker would be a ‘VIP Senior Cabinet Minister of the UK Government’. It didn’t need a rocket scientist to work out that the politician in question is aka as David Cameron. My countdown is set to the start of the XXth Commonwealth Games in Glasgow at 19 days to go. 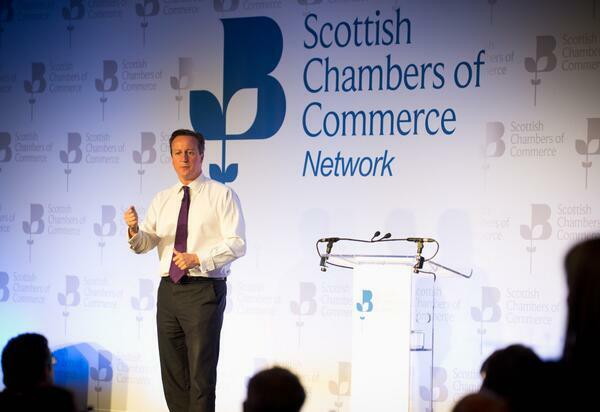 However the PM has his sights set on the Scottish Independence Referendum in September, so it was no surprise that the theme for the breakfast event revolved around the arguments for Scotland remaining part of the United Kingdom. With all this said David Cameron could not better his announcement yesterday of a City Deal for Glasgow and the region. City Deal means that £500 million will be injected in to Glasgow and the surrounding area to strengthen the economy. With the Scottish Government matching the £500 million pledge and local authorities in the Clyde Valley area contributing £130m, a £1.1billion infrastructure fund will be created to support the much needed city centre airport rail link and major improvements to the region’s roads and bus network. The City Deal is scheduled to create 28,000+ new jobs over the next 20 years. Stuart Patrick, chief executive of Glasgow Chamber of Commerce said of the pledge “We endorse the principal of City Deal on two counts. Firstly it will involve investment in economic infrastructure across the local authorities that make up the real Glasgow economy to promote economic growth. Secondly it requires firm discipline in agreeing the projects giving the local authorities a genuine incentive to choose projects that improve the economy and create jobs”. Financial pledges for Scotland like this are very welcome anytime no matter what party they come from.